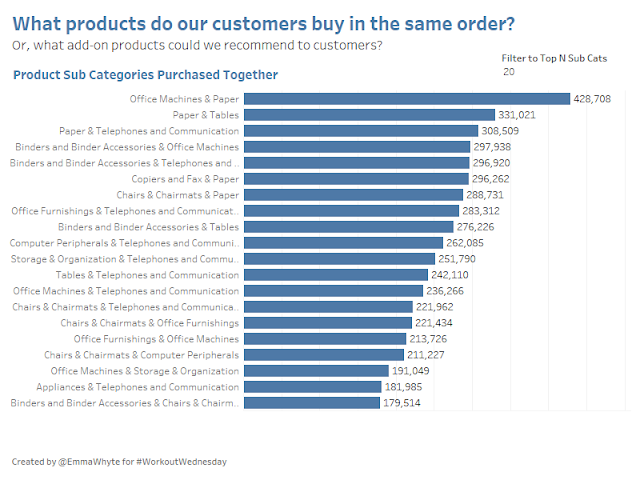 This week's #WorkoutWednesday requires you to create a Market Basket analysis in Tableau. It's a common ask, particularly in certain industries like retail. While the visualisation itself might not be that tricky this week, some data prep is going to be required. Market Basket analysis is often used with online retailers - enabling them to make those suggestions of what else you might be interested in purchasing. For this weeks task you'll need to use a Windows machine and use the Excel legacy connector to do this task. If you're on a mac you won't be able to do the join required (unless you have Windows on Parallels of course). Don't forget to download the data. Good luck! Remember to tweet @EmmaWhyte and @VizWizBI with #WorkoutWednesday with a picture of your completed viz.